At Broco Glass®, our extensive inventory includes glass models to fit all of your needs. We specialize in automotive glass for foreign and domestic cars, trucks, recreational vehicles and much more. We understand that your time is valuable, which is why we take care of your insurance claim from start to finish, offering you guaranteed hassle-free service. We are an approved vendor for the Insurance Corporation of British Columbia (ICBC) through the Glass Express certification, Royal Sun Alliance and most Vehicle Fleet Management Companies in BC. A windshield replacement is warranted against manufacturing defects and leaks (with the exception of leaks due to body deterioration) for as long as you own your vehicle. This warranty expires when your vehicle is sold or given away. This warranty does not cover damages resulting from vandalism, theft, acts of God, illicit activities, or self-inflicted damage. Windshield repairs are guaranteed as long as you own your vehicle. If the repair cracks again in the same spot, we will credit the amount of the repair against the windshield replacement cost. In the event a new windshield replacement is necessary, the insured party must pay any deductible owed under his/her comprehensive insurance policy. We proudly stand behind the quality of our products and our workmanship. We offer Original Equipment Manufacturer (OEM) glass made by the same manufacturer as your original glass, or certified equivalent glass made to the same standards, but by a different manufacturer. Our technicians are government certified in auto glass. Their extensive training and numerous work hours guarantee exceptional results. A stone chip can happen at any time and can quickly turn into a crack if it’s not promptly repaired, which can significantly weaken your windshield. 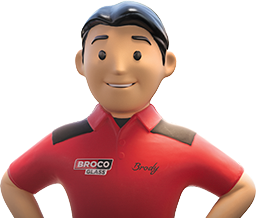 How do the experts at Broco Glass® repair a windshield? First, we make sure that the stone chip is clean so that the resin used to repair it adheres properly to the windshield. Next, we vacuum the area over the damage with a special tool that allows us to fill the stone chip with the resin. A special UV light is used to harden the resin, which takes approximately 3 minutes. Once the resin is dry, the windshield is cleaned of any excess and polished so that the surface is completely smooth. A damaged windshield may reduce the quality of your vision, which can make driving dangerous. A rock chip on your windshield can compromise the structural integrity and safety of your vehicle. A properly fitted windshield accounts for 30% of a vehicle's structural strength. A repair can save you money. Repairing your windshield is less expensive than replacing it. When a stone chip is repaired, it reduces the number of windshields that are disposed of in landfills. Want to know if your stone chip can be repaired? The damage is not located at the edge of your windshield. The circumference of the chip is no larger than a toonie. The windshield’s damage is limited to the outer layer of the glass. If after assessing your automotive glass damage our technicians determine that it cannot be repaired, your windshield must be replaced before you can get back on the road safely. How do the experts at Broco Glass® replace a windshield? Before replacing your windshield, we protect the vehicle by covering its exterior and interior, making sure no damage occurs. Next, the seal or glue that holds the windshield in place is cut and removed. A primer is then applied and allowed to dry before applying a special bonding adhesive that ensures a durable and proper fit once the new windshield is carefully placed on your vehicle. The special adhesive will need at least 60 minutes to set completely. Why replace your vehicle’s windshield? A cracked windshield reduces the quality of your vision, making driving dangerous. An intact, properly installed windshield can be a critical factor in keeping you safe.